My 7 year old is motivated by money. We believe he's at the age where he can appreciate the value of earning money to purchase the things he wants most. I don't think giving him an allowance will teach him any of the lessons we're working hard to instill in him right now and there are always plenty of tasks to do around the house so I created a system to both motivate him to help out AND help him earn money to buy the things he wants. In our house, the kids are mostly responsible for cleaning up their own messes (we help out but generally they're expected to manage their own rooms as well as the messes they create in our common spaces). We try to tackle the general messes as a family but being a stay at home mom means (to me) that most of the deep cleaning falls to me unless I ask for help. I now have a great system for asking for help and a terrific way to keep track of what needs to be done around here. This section of wall has been blank for a couple of years now so I'm really excited to find such a great use for it. We have a little command center now but this job chart is really the shining star of the area. 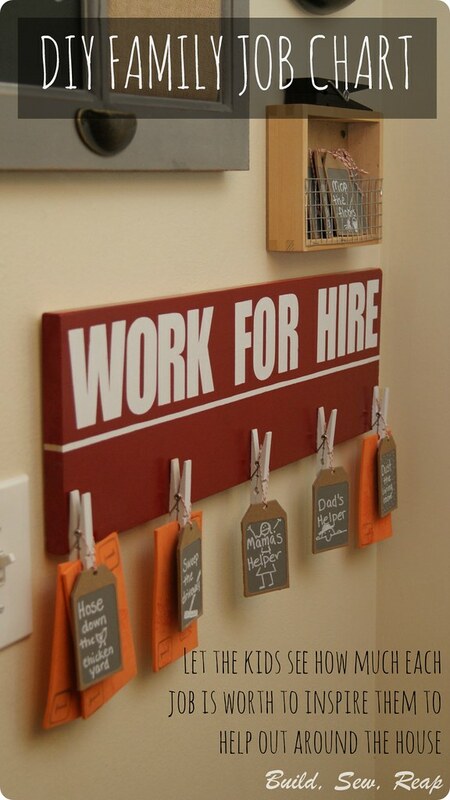 I painted a scrap piece of wood white with spray paint then used my Silhouette SD to create a stencil for the "Work for Hire" letters. I then spray painted a deep red glossy paint over the board until I got a good solid coat. I also disassembled 5 basic wooden clothes pins and spray painted them white. Once the pieces were all painted, I used Gorilla Glue to attach the clothespins to the board. 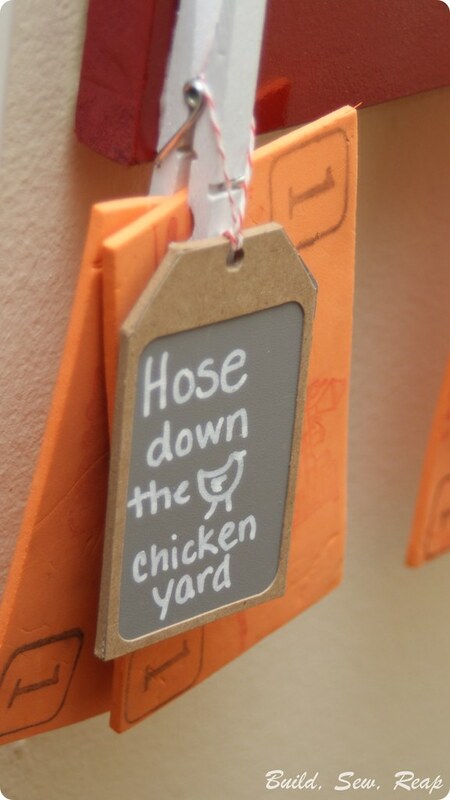 At first I wasn't sure how I'd mark the jobs but today I happened upon a clearance sale at JoAnn Fabrics and Crafts where I found those cute chipboard tags with chalkboard windows on them. I also picked up a couple of white chalk pens for the project. I had the red and white bakers twine which I used to make the loops to hang the tags. For each task, I hang the chipboard tag and then I clip the appropriate number of Kid Cash bills in the clothespin. Kid Cash can be traded in for real money at purchase time but is a lot easier for me to stomach when it gets lost (it isn't replaceable for him but at least it's not real money if it goes missing). 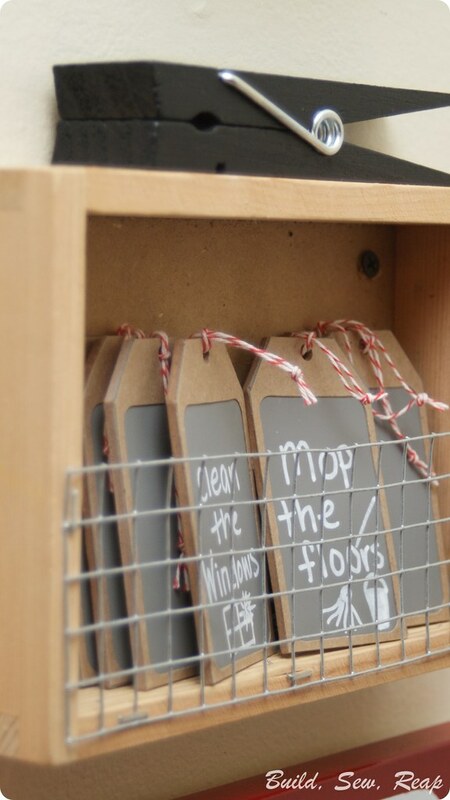 Not wanting to have to rewrite the tasks out new each time, I picked up more than enough of the little chalkboard tags but wanted to find a way to keep them close to the sign. I headed out to my garage where I pretty much just stood and stared at the shelves until I saw a little Melissa & Doug box among my basket collection. I grabbed it and some hardware cloth which I cut to size and stapled into place and voila! I had a cute little box for my tags. 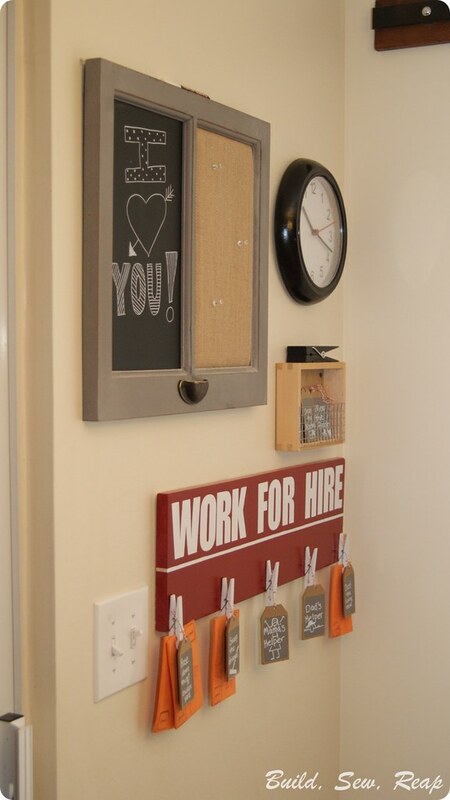 I had also picked up the giant black clothespin and a cute chalkboard/bulletin board combo on clearance at JoAnn today and I thought they balanced out the space nicely. Finally, I grabbed a clock from the kitchen (it was in a dumb spot quite frankly), taped it off and spray painted it black then hung it in the remaining space on the wall. How do you encourage your kids to help out around the house? Are they motivated by money like mine is? So motivational. I really appreciate your DIY movement.